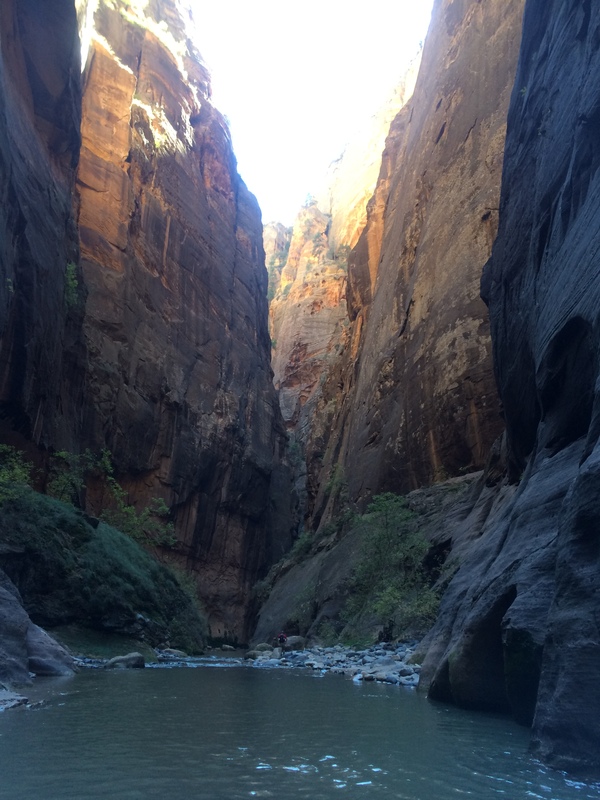 The Narrows is a narrow stretch of Zion Canyon which has been carved out by the twisting and turning of the Virgin River over centuries making the gorge walls over 2,000 feet high on either side. At times, the river is only 20 feet wide. 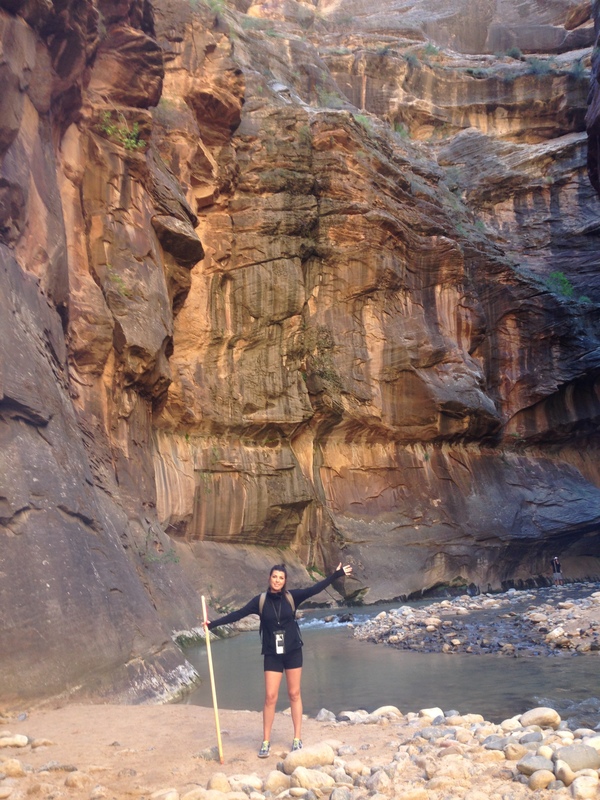 Zion is enormous! 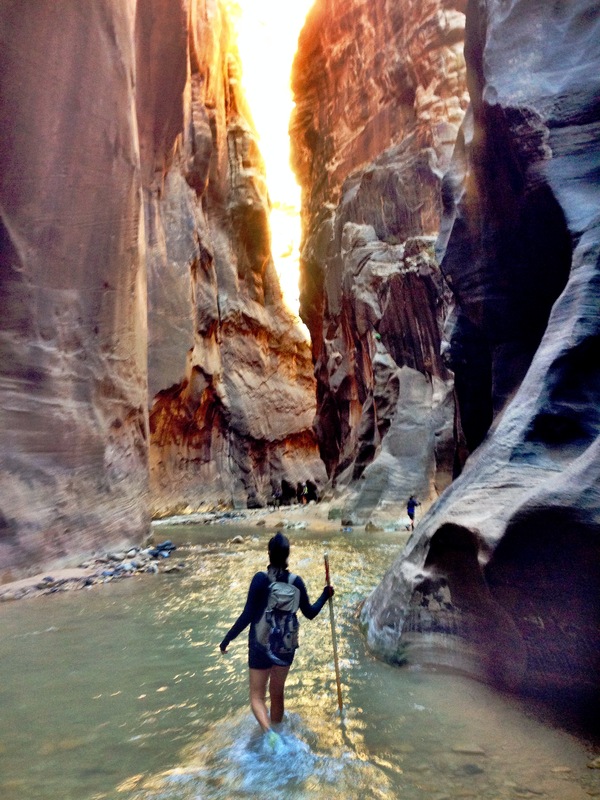 There are so many hiking trails, slot canyons, camping spots, and scenic overlooks its not even close to possible to see it all in a day or even in a week. 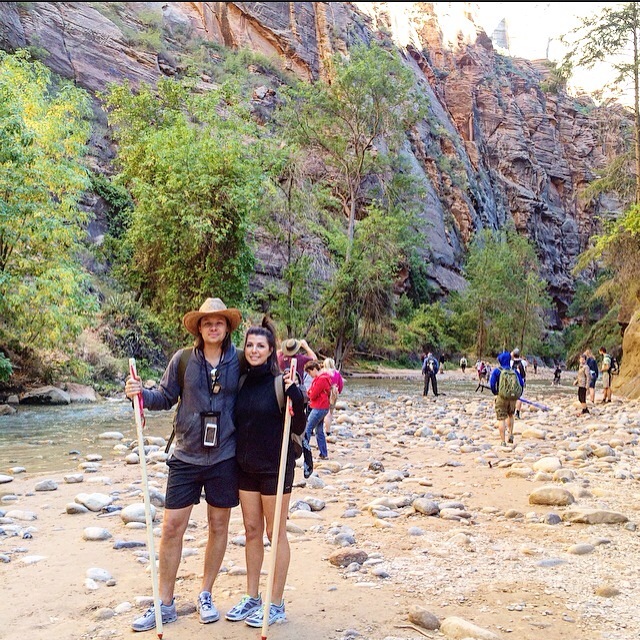 We only had one day (and the next morning) to spend here, so we knew we wanted to hike the Narrows and Angel’s Landing, but Angel’s Landing was closed for repairs during our trip. The Narrow it was! We started our morning bright and early, ate our complementary hotel breakfast (which was pretty good, actually), and headed to the Springdale Shuttle Stop to hitch a ride to the park. 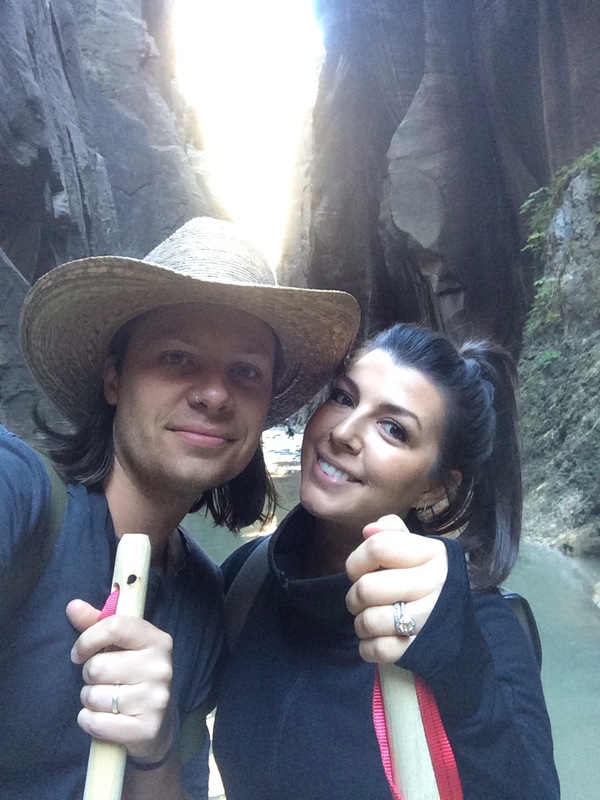 Once at the park, we paid our admission fees and made our way to another shuttle, the Zion Park Shuttle, and settled into our 40 minute ride through Zion to our final stop at the Temple of Sinawava. The shuttle was a great way to see amazing views of the park we wouldn’t have been able to see on our somewhat short trip to Zion. At our shuttle stop, also know as The Bottom UP Hike starting point, we made one last bathroom stop (TMI?) 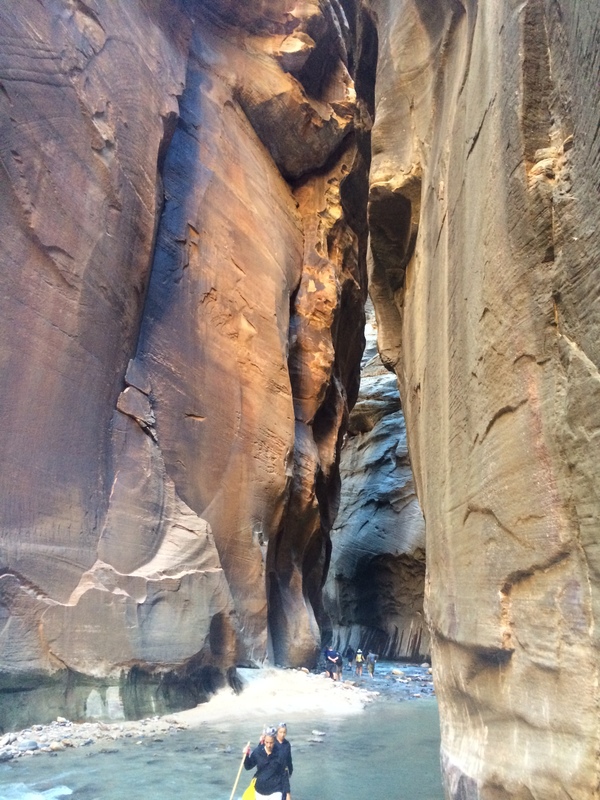 and contained our excitement as we made the easy and brisk one mile walk to the start of The Narrows. At the start of the river a lot of people simply stopped here, wadded in the shallow waters, took photos, or let kids play and turned back to the shuttle stops. Not us! There is no trail. The hike is in the river. The first step in the water was c-o-l-d! But just a few feet later, the views captured our attention and we forgot all about our cold feet. 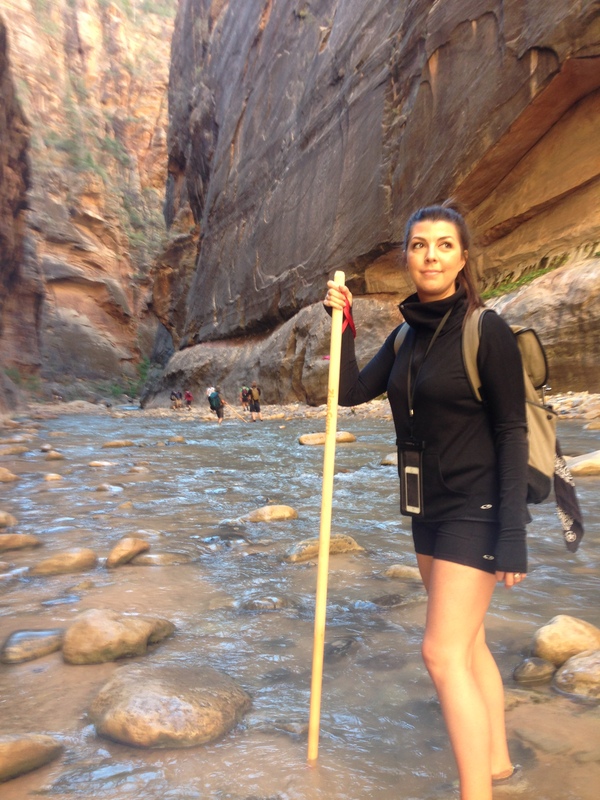 Hiking this mystical river has been a dream of mine, and at times, I really could not believe I was actually doing it. 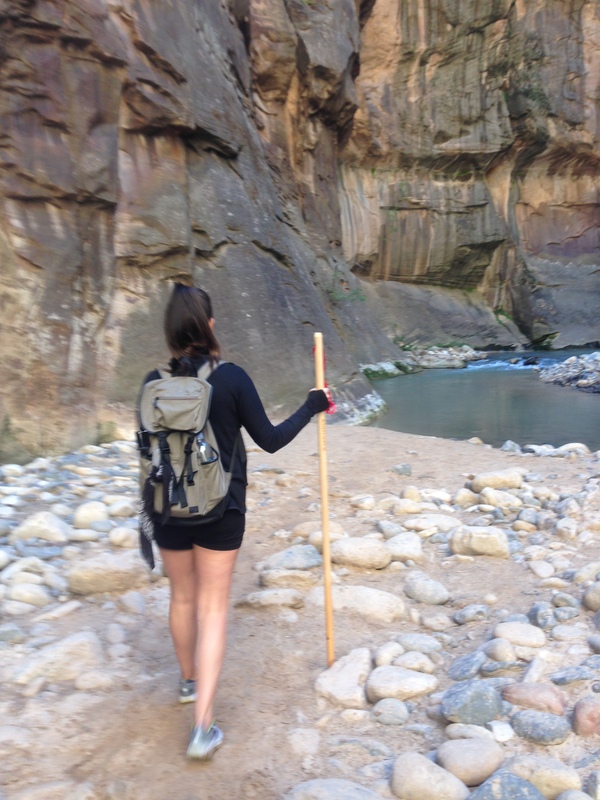 We trekked along, feeling the river floor with our walking sticks, making sure not to get caught in a hole and dunk ourselves in the water. The hike was about 60/ 40: water to dry land. 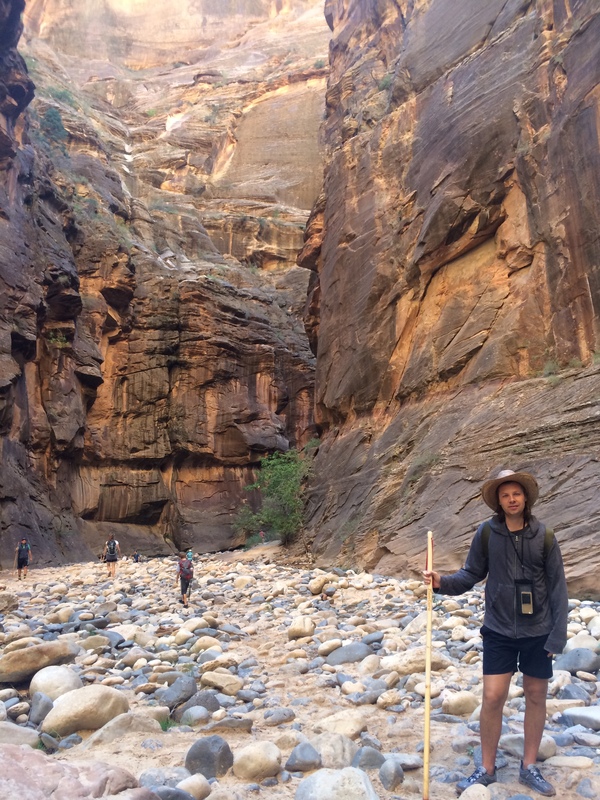 The river was about mid calf deep most of the way with some places thigh-high or even hip-high, and the floor was pretty rocky. The park website compares walking on the river floor to ‘walking on bowling balls’. Accurate. 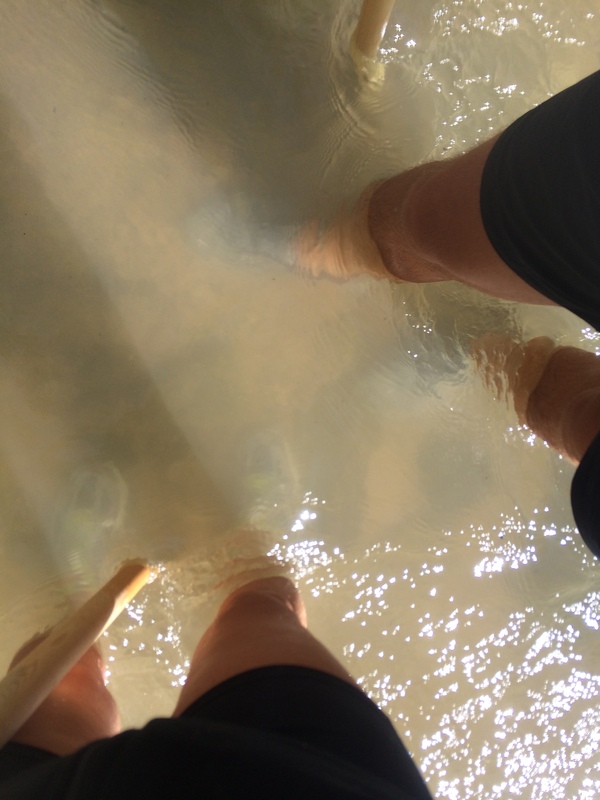 We saw some hikers ahead of us walking into hip-high waters, we easily maneuvered our way around them to higher ground and managed to escape getting submerged the entire round trip. Mental note: deeper water= darker in color, shallower water= lighter colored. The views on this hike are indescribable. The walls are so tall and the colors are so pretty. We would hike a while, Owen would stop to help me cross a swift patch of river, we would stop again to take some pictures, and stop again to take a breather to just look up and take it all in. 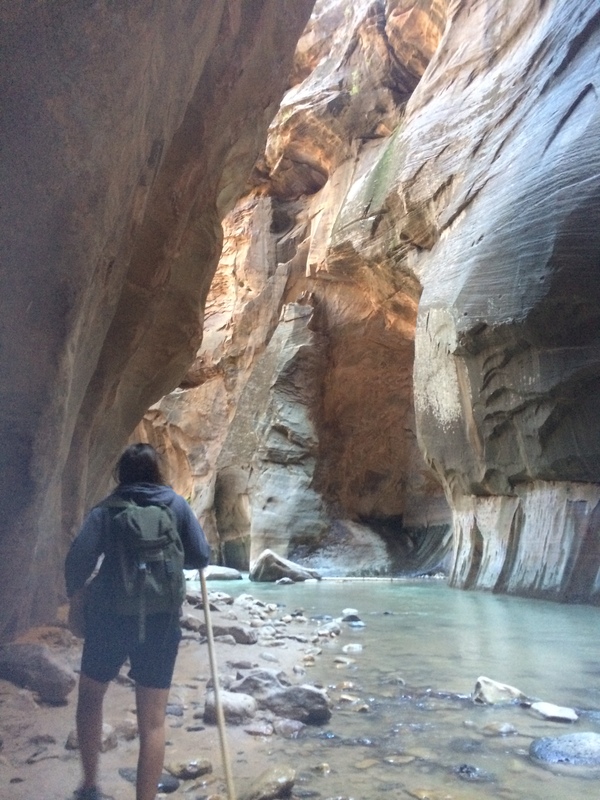 When we made our way to the infamous “Wall Street” section, where the river is only 20 feet wide, Owen and I both couldn’t believe our surrounds. So insane. We hiked about 2 and a half hours before turning around and making our hike back to the start. At our turnaround point the crowd really diminished. We went from being kind-of surrounded by people to not seeing a sole for about 30 minutes. On our trek back, we found a dry spot and ate our lunch. Lunch with a view. When the hike came to an end back at the start, we hopped on the shuttle and made our way back to the entrance of the park. Owen fell asleep on the ride, and I listened to people all around us recounting their day and their hikes. What a day. I cant wait to do it all over again. And again. And Again. 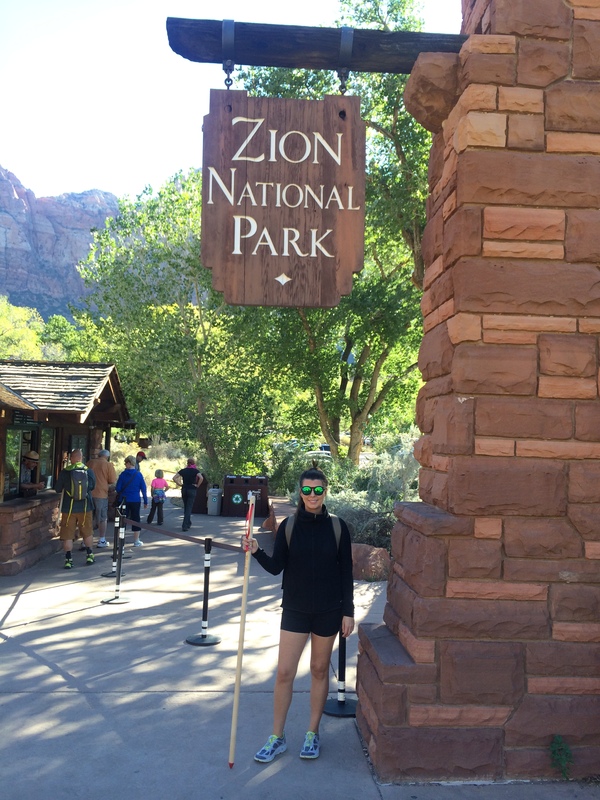 Springdale Shuttle stops in are all over and every 15 minutes to take you to the Zion Park entrance. 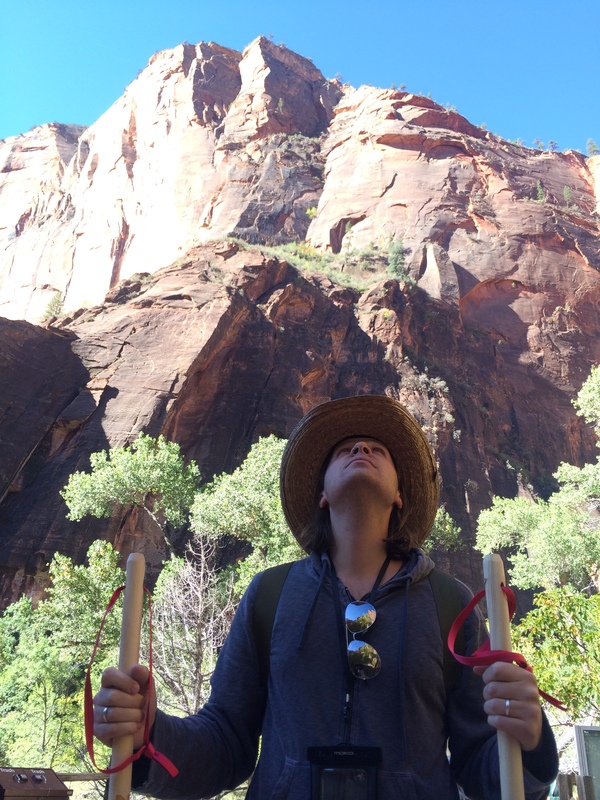 Zion Park Shuttle stop for the Narrows is at the Temple of Sinawava. Iphone camera users: Use a waterproof iPhone case with a lanyard to be hands free, just in case you fall in the water or drop your iPhone- you’re still able to snap away! I have this one. The crowd: There are people of ALL ages on this river hike. Seniors, solo hikers, Moms with newborn babies, Dads with babies strapped to their backs, families with multiple kids, two year olds, all ages. You will see people wearing all sorts of apparel. Jeans, rain boots, tank tops, flip flops, but come on. If you’re hiking- dress accordingly. Wear Water shoes or Hybrid Shoes (terrain AND water). We wore Columbia Powervent Trail Shoes. Links: His and Hers. Wear waterproof band-aids anywhere shoes MIGHT rub BEFORE starting to hike to prevent rubbing, like the backs of ankles. 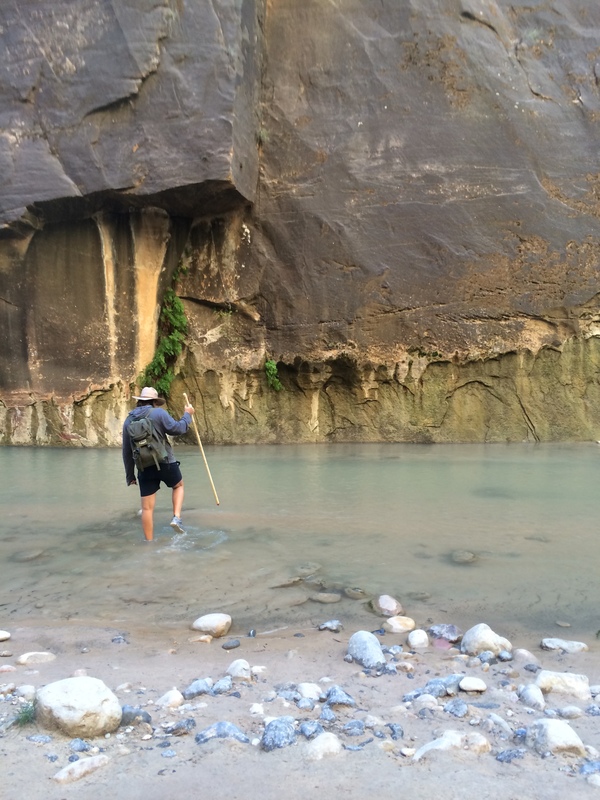 All shoes will start to become uncomfortable after 5 miles of hiking in sandy water. Wear layers to keep warm. It’s warm, chilly, or freezing depending on time of day. Wear quick-dry clothing! Again, in case you get wet. Pack drinking water and sealed food. At some point in the hike, you’ll get hungry. We each packed a sport top water bottle, an English muffin, Justin’s peanut butter squeeze pack, a banana, protein bar, savory trail mix, & a hummus pack with pita chips. 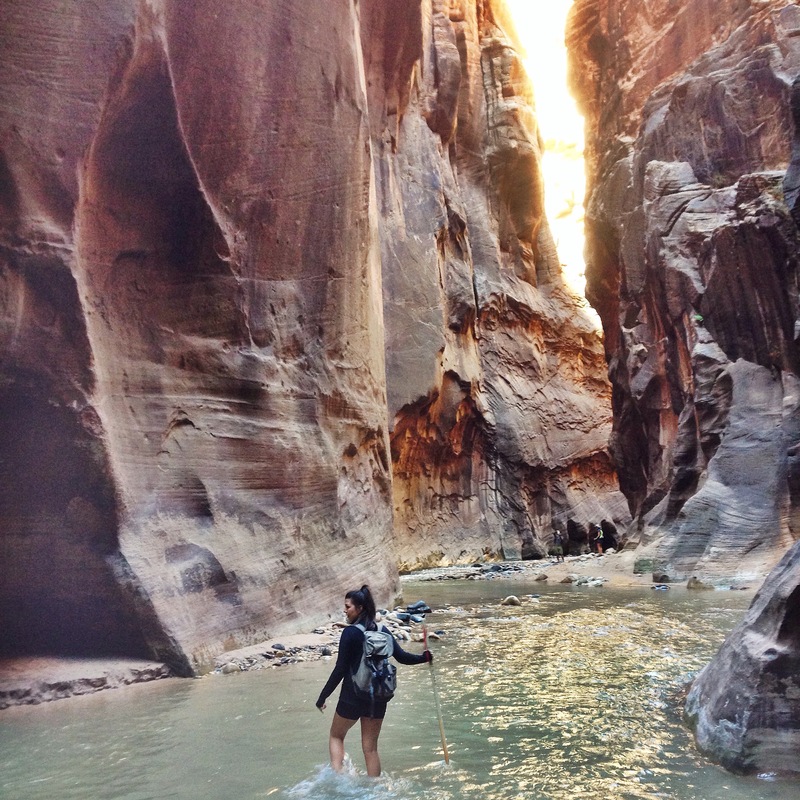 Whatever you pack in your backpack, make sure it’s all in waterproof bags- just in case you get wet. We packed everything in separate Ziplock bags: food, keys , wallet, change of shorts, etc. Take a walking stick. A must. We bought ours, and it was the best $13 ever spent. Much needed to help wading through the river. They are available at the visitors center and bonus- it’s a great souvenir. There is a rental shop at the park entrance that rents anything you need: hiking gear, hiking clothes, waterproof clothes and shoes, walking sticks, you name it. About $40-$50 for head-to-toe waterproofing. In my opinion, skip neoprene socks. Sure they might make your feet slightly warmer, but the water will be well over ankle length at times, and the socks will only fill with water and will not drain. 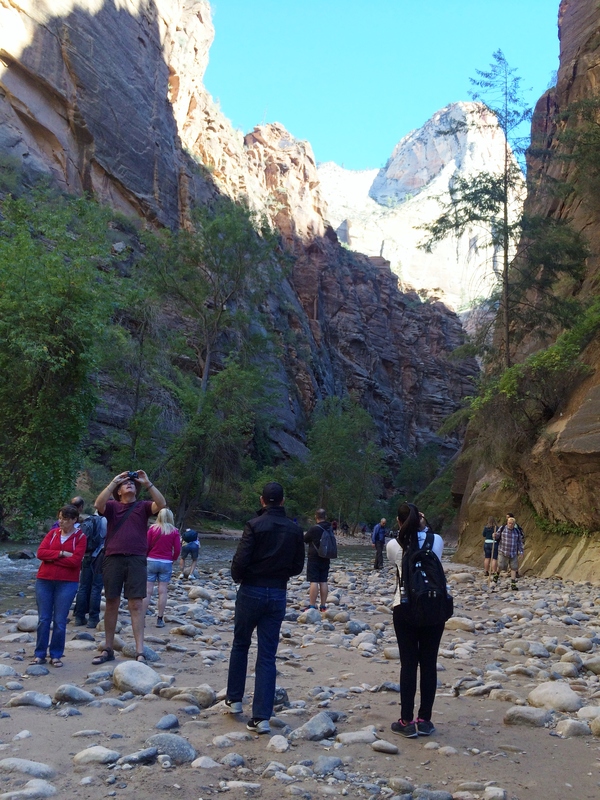 Check the park shuttle schedules before embarking on any trail, and plan accordingly. Make sure to note the last shuttle out of the park. 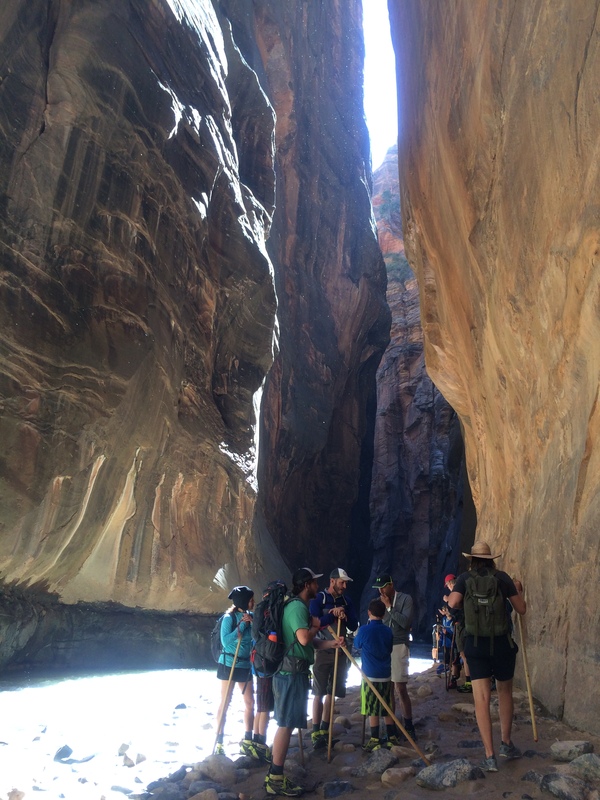 If hiking The Narrows from the bottom up, make sure you save energy for the hike back. Remember the final destination is only half way because you hike back the way you came. Always check the park website for current weather notices. Flash floods are a real danger. 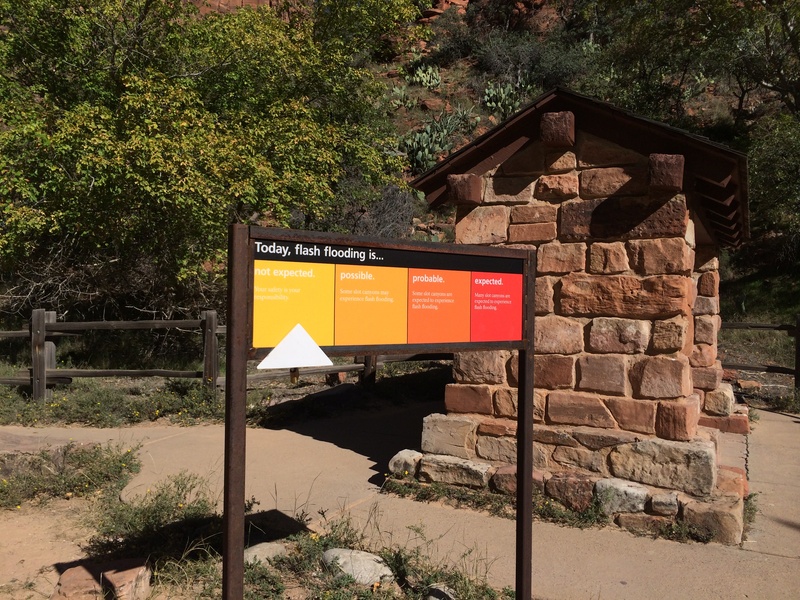 The park will have signs regarding the level of expectancy of flash floods. HEED the WARNINGS. Well, there’s another box checked off the Bucket List. 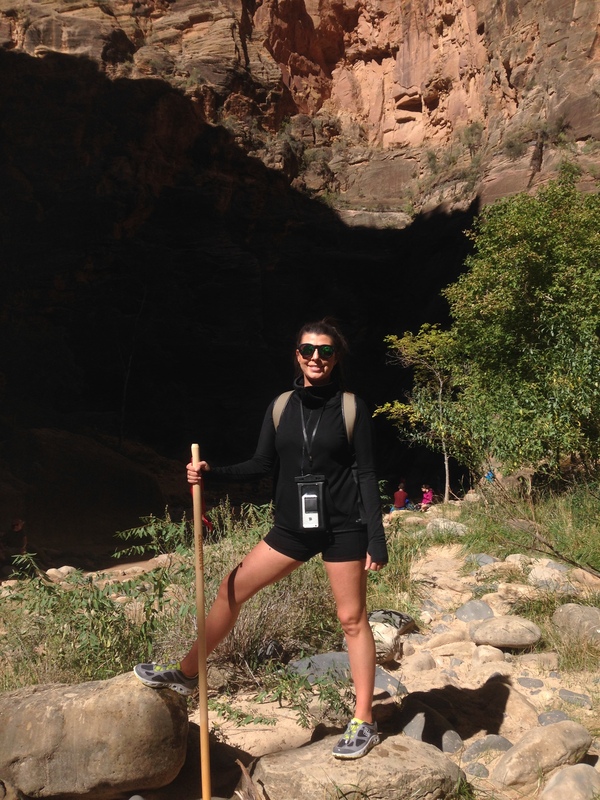 This entry was posted in Travel and tagged Adventures, Angels Landing, Columbia, Hiking, National Parks, River Hiking, Road Trip, The Narrows, Travel Guide, travelblog, Utah, Virgin River, Zion, Zion National Park. Bookmark the permalink. Very cool! 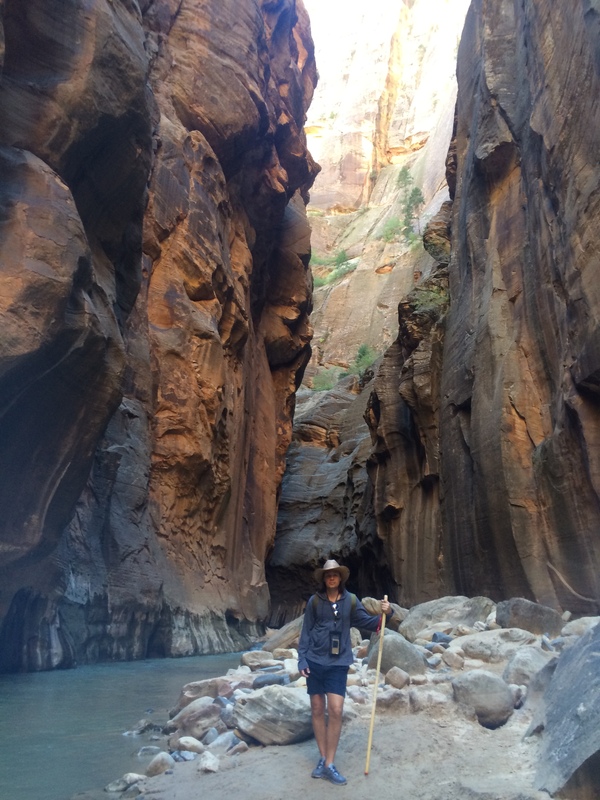 When we were at Zion, we hiked most of the way to Angel’s Landing, but didn’t do the Narrows. I really want to go back and hike it too! Great photos! Thank you! 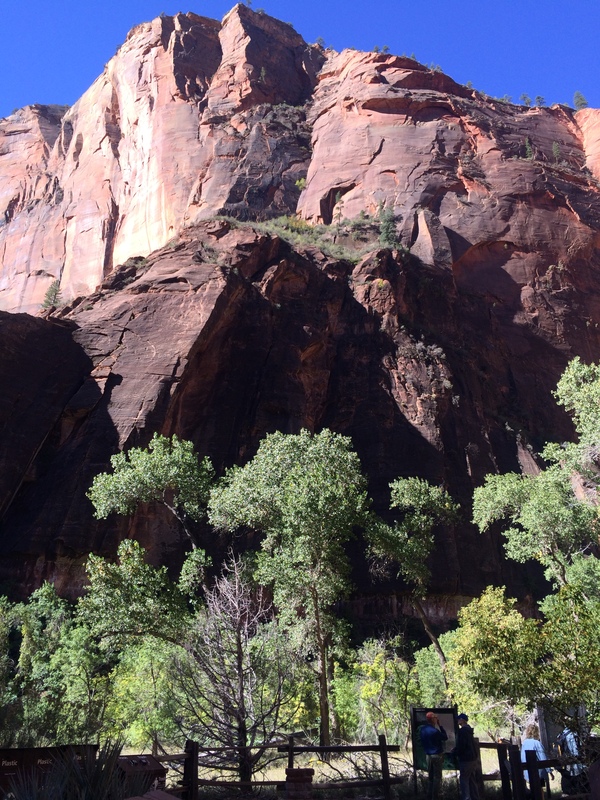 I really want to hike Angel’s Landing! I bet it was amazing. 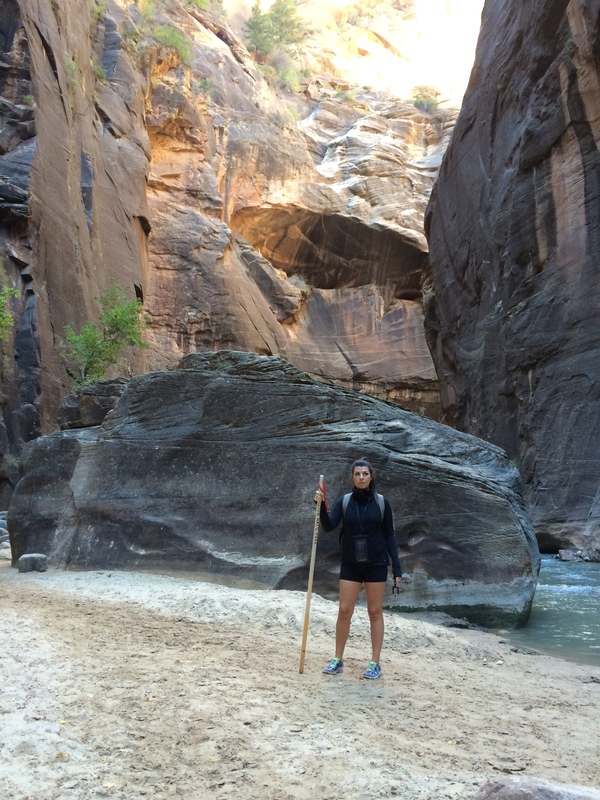 Here’s my post about Zion if you’d like to check it out!